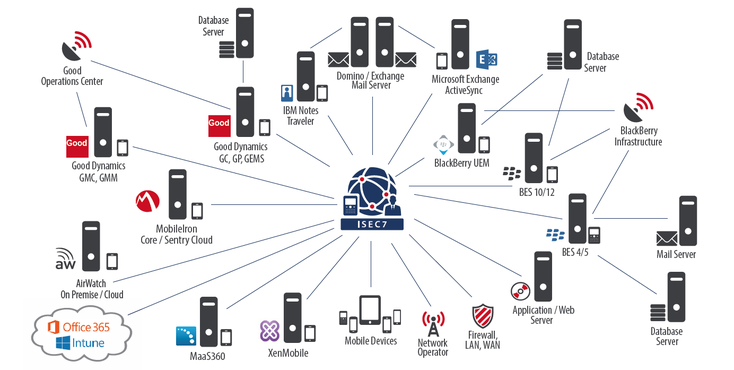 The ISEC7 EMM Suite is an OnPrem or Cloud based monitoring and management system dedicated to the needs on Enterprise Mobility Operations. Our solution monitors more than 750 parameters in a mobile infrastructure to ensure efficient operations by integrating leading UEM / EMM solutions, affected legacy components and systems like Active Directory, standard messaging platforms and database environments as well as active network components and network operators. Get more insights and schedule a live-demo with one of our experts!